Scripts & Scrolls aren’t just two things that keep the internet running, it is also the title of the newest offering from reggae artist Zamunda. Hailing from St. Ann Jamaica, the singer, who first started appearing on the B-sides of 7-inches around 2007, has expanded his role in the musical process, taking on production duties since the emergence of his label, Sweet Water Spawn Music, in 2016. As a Sweet Water Spawn release, Scripts & Scrolls is the most control Zamunda has ever had over a long-form project, and he seized this golden opportunity to make the exact album he wanted to make - one which showcases his broad range of newly expanded talents. The production on Scripts & Scrolls is remarkably polished for a “new” producer and, although the vibe is in-line with what you would expect from a contemporary reggae album, the project also has a unique, almost avant-garde sound. Zamunda’s creative choices, such as his specific blend of live and automated instrumentation, his repeated insertion of live audience tracks, and his use of authentic audio from Malcom X in the intro, are what give Scripts and Scrolls its distinctive feel. At times these choices may seem to stray too far from traditional reggae paradigms, like when Zamunda wears his vintage American influences on his sleeve with the retro-style Pecker’s Point and his cover of Blood, Sweat & Tears’ 1969 hit, You’ve Made Me So Very Happy. But the singer’s talent and precise execution will win listeners despite possible misgivings about his the choices he makes throughout the album. From a purely musical standpoint, Zamunda, mixes up many styles - hip hop, lovers rock, rockers, early rock ‘n roll, and acoustical - on Scripts & Scrolls, but he sounds most at home as a vocalist when accompanied by serious reggae riddims. Subsequently, the top selections from this record are tunes like Can’t You See, Burn Dem Down, and Greatness - songs aligned most with the current trends in conscious reggae. Burn Dem Down is particularly fire, fueled by Zamunda’s explosive deejaying style, which is yet another impressive tool in this versatile artist’s box. Conscious reggae fans will also like This Feeling, a love song with a rootsy vibe, accented by rhythmic, synthesized horn riffs, as well as the caribbean travel advertisement, West Indies, which has a stripped-down, reggae/R&B appeal. The amount of effort that Zamunda puts into his craft is evident, not just by what’s on Scripts & Scrolls, but by what’s not on it as well. He is a commonly featured artist on jugglings from a wide variety of labels and it is common practice for reggae artists to piece their albums together from various riddim album contributions. Since Zamunda did not build this project from previously released juggling selections, it is likely he had to invest an incredible amount of time writing and recording the exclusive tracks that make Scripts & Scrolls a one-of-a-kind project, not to mention the production and administrative tasks required from a label releasing a record. Zamunda has had some big tunes over his decade-long career as an artist and he has already built a worldwide following, but with his work ethic, drive, talent, and an ever-expanding arsenal of resources, he is destined for even greater things than what he’s accomplished thus far. 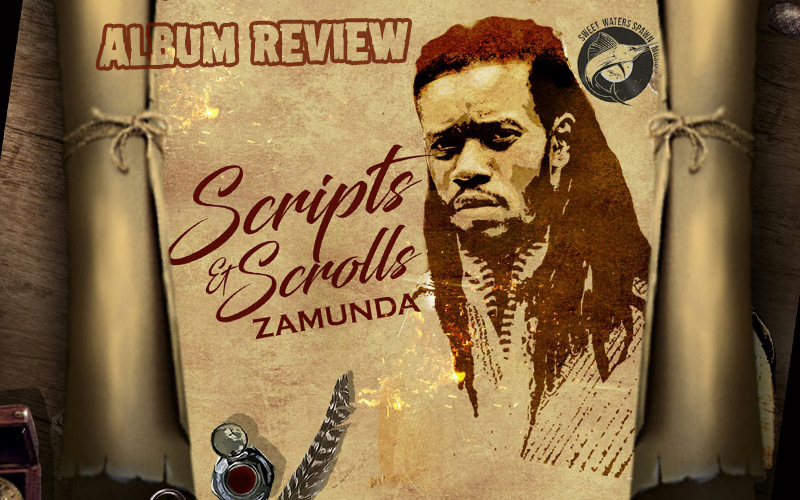 As his first full length release built from his own production and released on his own label, Scripts & Scrolls is the first paragraph in a new chapter of Zamunda’s story.